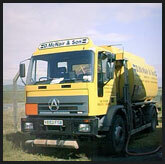 Our organisation is a long established local family operated fuel company, serving primarily the Kintyre peninsula in South West Scotland. We have built strong relationships within the farming, business and domestic markets and are very mindful of their requirements, concerns and demands. Ever aware of the changing needs and responsibilities of our customers and external bodies, we are keen to be pro-active and forward thinking regarding both our obligations to the environment and flexible and adaptable to our clients’ requirements. Although ever changing, you can always be assured that our business, which has solid roots embedded within the community of Kintyre, takes our responsibilities and business seriously. May we take this opportunity to thank the people of Kintyre who have supported us since 1903 to date, and beyond.